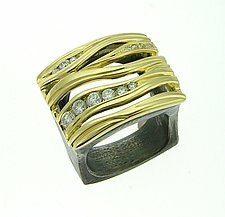 "I have always enjoyed working with my hands and I love the tactile quality of working with metal. I do not have a single style but rather a more playful approach to design. 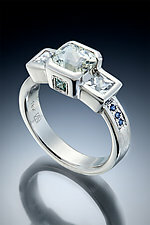 I like to challenge myself and create pieces that are not only beautiful but also interesting. " 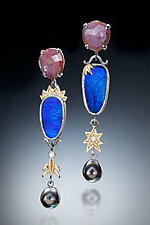 With an emphasis on color, weight and texture, jeweler Leann Feldt designs pieces that are modern in design, yet often include filigree and a unique use of open space. The artist begins each piece with detailed sketches, followed by a wax carving of the proposed piece in three dimensions. Feldt loves the process of carving the wax, and with her custom work, this process allows customers the opportunity to make changes before committing to a final piece. Feldt graduated from the metals program at Rochester institute of Technology and worked in the field for a number of years before starting her own business. 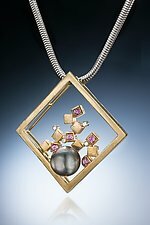 She has won four awards with the Wisconsin Jeweler's Association for her designs and was a finalist in the Jeweler's Choice Awards 2011.